This is just the sort of album to bring relief to any tired reviewer! Happy to Meet whisks the listener instantly to West Clare, its unhurried graces ever easy on the ear and possessing enough charm to put a fakir out of business. The name of the Lahinch-based flute-player P.J. Crotty will be familiar to many who’ve visited Clare or remember him from his days in London during the 1970s and, let’s not forget, he’s married to Angela, daughter of Junior and Cissie Crehan. The Cullinans may be less well-known (unless you’ve stayed in their excellent guesthouse in Doolin). 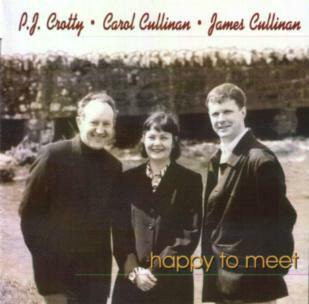 James, the fiddler, hails from Derula, near Kilnamona, and appears on Kevin Crawford’s album In Good Company, as well as banjo-player Kevin Griffin’s Ossian label CD. Finally, Carol was born and raised in Ennis and was taught to play traditional music on the piano by Geraldine Cotter. The trio are joined on Happy to Meet by the album’s producer, Kevin Crawford, who unveils his skills on the bodhrán, alongside Mick Conneely who hangs up his fiddle in favour of the bouzouki and, finally, John Blake who appears on guitar and piano. The album’s tune selection is exemplary, not least in the variety on offer – reels, jigs, hornpipes, barndances and both a waltz and a slow air for good measure. Their sources are predominantly from Clare and neighbouring Galway with a smattering of compositions by the likes of Paddy O’Brien, Michael Gorman and James Morrison. However, no matter the source, the relaxed West Clare style dominates the proceedings and is best heard on Junior Crehan’s The Sheep in the Boat and the reel Tomeen O’Dea, the latter offering both P.J. and James the chance to explore the melody’s various directions. All this and more is aided on many of the tracks by some of the best, most understated piano accompaniment heard for a very long time. Guaranteed never to pall, Happy to Meet should be top of everyone’s shopping list. Written for TIMR by Geoff Wallis. For more details about this album contact cullinans@eircom.net.